For now, let me recommend the food I enjoyed most while travelling through Bolivia. There is no dish more typically Bolivian than this one. 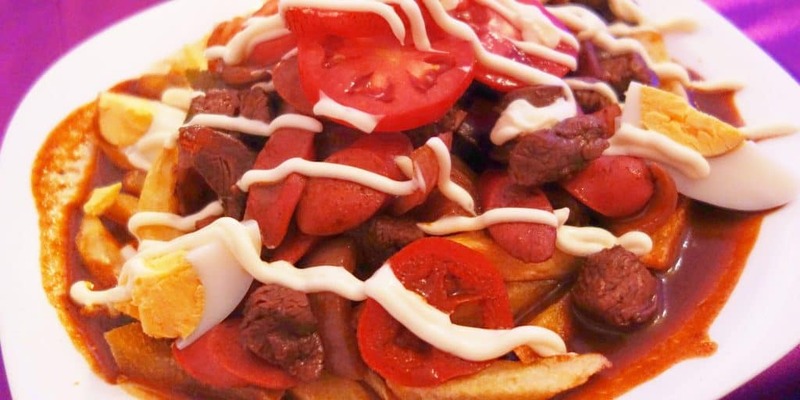 It is a huge plate filled with beef, sausage, boiled eggs, french fries or potatoes, onions and red and green peppers. Ingredients vary from one city and also one restaurant to another but one thing is certain. You will not be hungry anymore after ordering this dish. Most portions are large enough to feed at least two people. When ordering, make sure to specify the degree of spicyness you would like (piquante is spicy in Spanish), as some restaurants like to add a lot of chillies. Fritanga de cerdo is one of the dishes I tried on my foodie tour in La Paz. 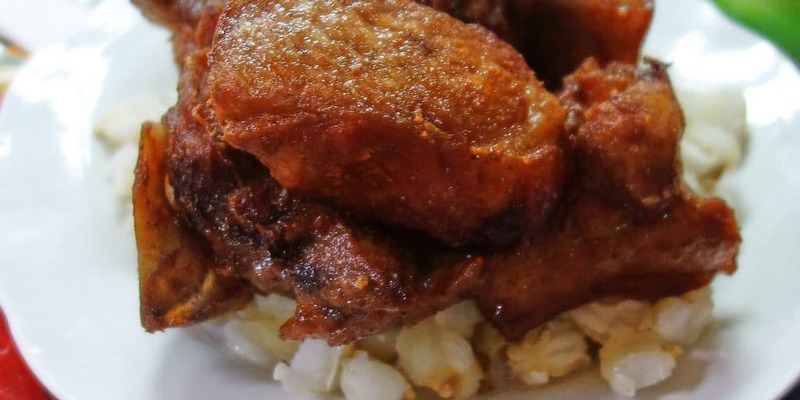 It consists of well-cooked pork covered by a spicy red sauce that contains lots of garlic and onions and is usually served with corn and (dehydrated) potatoes. The dish, as our guide explained to us, is often served on regional holidays in Potosí and Sucre. If you are wondering what dehydrated potatoes are, take a walk across a local market. They look almost like rocks, either white or dark purple, and can be kept for many years. To cook them, they are soaked in water for a night and then prepared like regular potatoes. This is a pork dish somewhat similar to fritanga de cerdo. It originated in Cochabamba, where they cook it on weekends and where it is prepared in front of the costumers who then eat it. 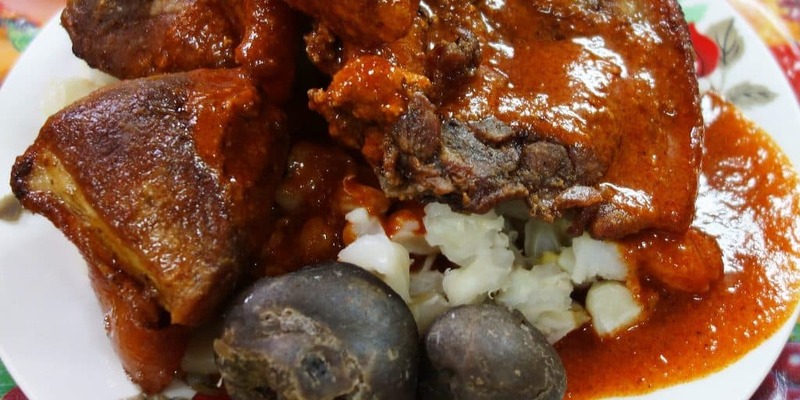 The meat is cooked for a long time in a mixture of its own fat and chicha (an alcoholic drink made of corn). It is also served with corn and potatoes, but unlike fritanga, it does not come with a spicy sauce. Chicharrón de cerdo might not look like the most appetising dish if you find it on the menu, but it is definitely worth ordering for its deliciousness. Api is, without doubt, my favourite Bolivian drink. It is made of purple corn, cinnamon, cloves and orange peel. As it comes from the Andes, it is served hot and tastes like Christmas. 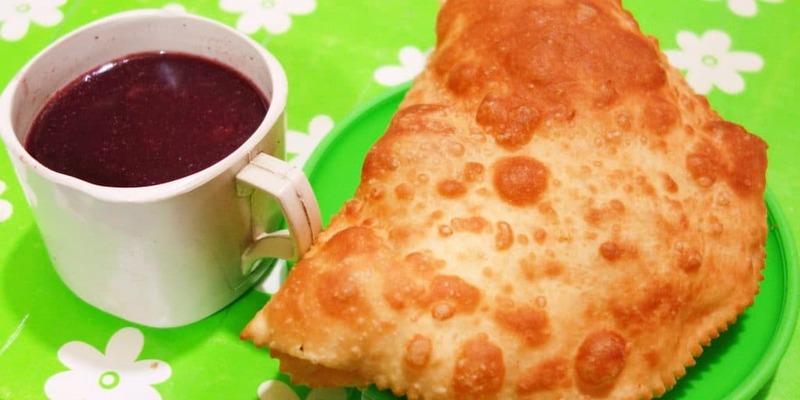 When you order it, it is usually accompanied by pastel, a fried cheese-filled pastry. You can get api con pastel at most marketplaces, close to the juice vendors. Also, if you happen to be in Bolivia for Carnival, you will find this drink sold by street vendors everywhere. 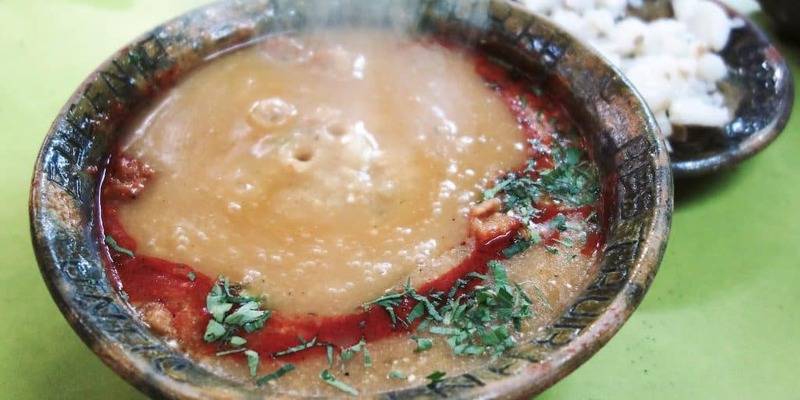 Sopa de maní is a peanut soup that is said to originate from Cochabamba. The soup is made with potatoes and ground peanuts, that give it a milky appearance and creamy texture. 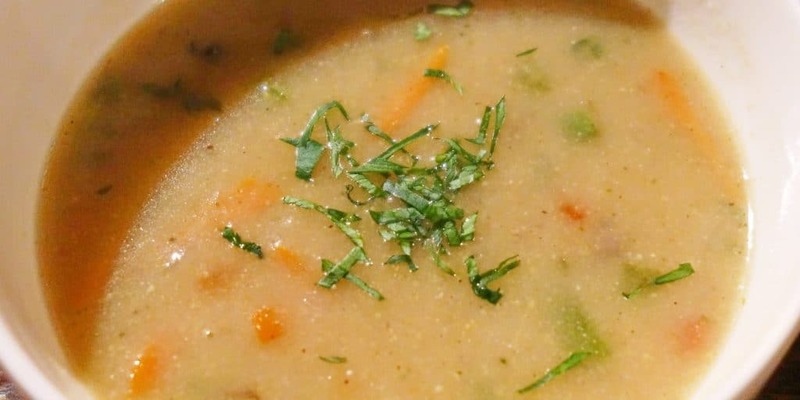 Besides potatoes, you will find beef and vegetables like carrots and celery in it. 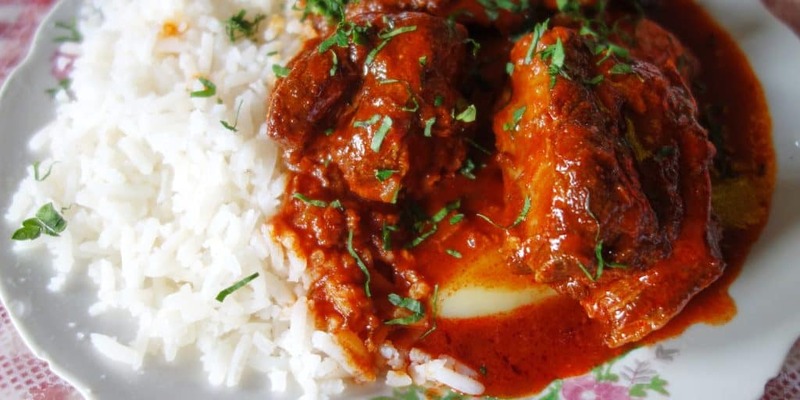 When you order it, you will usually also get llajua, a red Bolivian sauce that you can use to add spicyness to the dish. 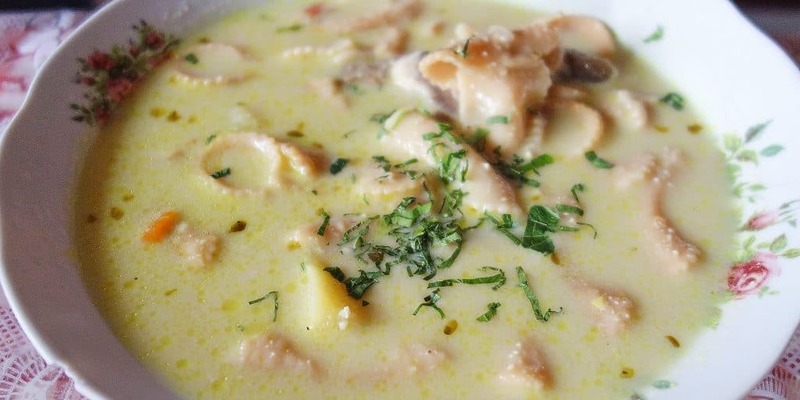 Talking about soups, Jankaquipa is another Bolivian soup that you should try. It is one of the dishes I had on my foodie tour in La Paz. The soup is made with corn, onions and, of course, potatoes and is a typical starter served in the Andes. Mondongo is another pork dish. The meat, which still has a lot of fat on it, is cooked in a sauce with onions, chillies, cumin and various other herbs and spices. Sometimes, yellow colorant is added. It is then served with potatoes and, as you would expect, corn. While mondongo is a typical dish served at All Saints Day, you can get it all year round at marketplaces everywhere in the country. You might have eaten chorizo in other Spanish-speaking countries before. In Bolivia, this is a very typical dish to buy from one of the food stalls at market places. A cook at a market in Sucre described it to us as one of the most typical dishes she had. Chorizo is a spicy pork sausage which is (since this is Bolivia and they have hundreds of varities of potatoes) usually served with potatoes. While local not only to Bolivia, it is delicious and you can have many varities everywhere. A multivitaminico is a shake you can find at the juice stalls on the markets of La Paz. It consists of a variety of fruits, vegetables and cereals blended together. In Bolivia’s capital, students like replacing lunch with this shake because the vitamins are supposed to help with studying. For tourists, this is the perfect shake to get as an afternoon snack, when you’re running low on energy. But beware, do not go for the largest serving. The multivitaminico is so thick and heavy that I could not finish mine. 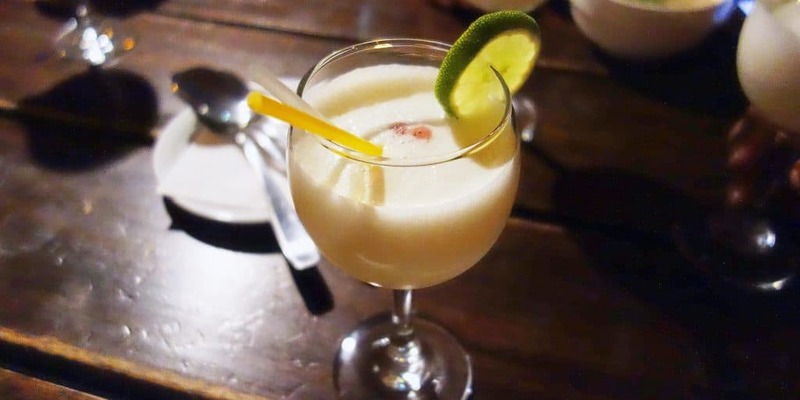 The Singani Sour is Bolivia’s version of the Pisco Sour. It is made with lemon juice and, of course, singani. Depending on where you get it, you can find multiple variations of this cocktail that add different ingredients (like ginger ale or orange peel). Singani, the main ingredient in each of these cocktails, is a typical Bolivian type of alcohol, a kind of brandy that is made of distilled wine. It was invented by Spanish monks who had moved to the Andean country. Kalaphurka is a traditional dish from Potosí that is consumed for breakfast. It is a soup consisting of chili, beef or llama, corn flour and, of course, potatoes. Before serving it, the waiter will drop a hot volcanic stone in the bowl, making the soup boil for at least another fifteen minutes. If you want to try kalaphurka in Potosí, walk from the city centre towards the graveyard. Most restaurants serving this typical dish are located in the neighbourhoods around the cementery. Jelly might not be a dish that can only be found in Bolivia, but I have never seen as many varities anywhere in the world. Street vendors have bags with jelly that they sell for a couple of cents. 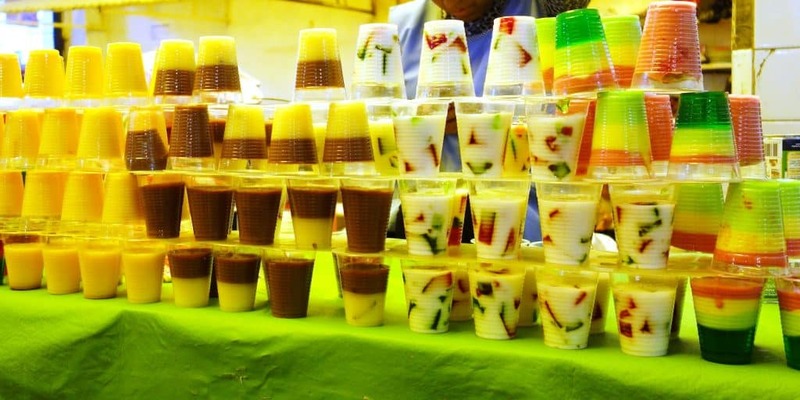 On market places, jelly stalls have cups lined up, with jelly in all colours. They serve it with joghurt or condensed milk, or sometimes even both.